What’s Your Climate Resilience Moon Shot? At a recent “Challenges and Opportunities of Private Sector Climate Resilience” conference convened by the Multilateral Investment Fund of the Interamerican Development Bank in Cartagena, Colombia, I moderated a panel of three of the world’s resilience experts and posed this clinching question: What is your resilience moon shot. · Emilie Mazzacurati, founder and CEO of the award-winning Four Twenty Seven climate consultancy (one of two firms worldwide exclusively adaptation-focused), responded in keeping with her leading-edge analysis, research and strategy work. Her resilience moon shot? A climate adaptation unit. “We need a measure of resilience that allows the market to see progress over time,” she maintained. · Eric Kaufman, indefatigable head of the Natural Resilience Foundation to establish financing mechanisms for public resilience projects such as Staten Island’s New York Wheel project, offered: densification of Orlando with all of Southern Florida’s residents safely located on higher ground and the rest of the land-turned-to-sea becoming a glorious water park. · Dale Sands, senior vice president and Global Director, Metro and Adaptation Services for engineering giant AECOM and lead of such game-changing projects as the UN Disaster Reduction Department (UNISDR), favors a risk-sharing mechanism for small businesses. It would be based on insights gleaned from AECOM’s survey of 208 New Orleans small businesses. I will reveal my climate adaptation moon shot as I launch Climate Resilience, a consulting firm helping corporate and local government leaders to incorporate climate adaptation into their value chains. What’s your resilience moon shot? Attending the Carmin Symposium on Urban Climate Adaptation last month, I had the pleasure of being reminded over and over again why experts the world over looked to Dr. Carmin for insights and guidance to galvanize urban adaptation. What internal and external factor shape the ways in which poor and marginalized urban residents can participate meaningfully in planning and action for urban resilience? What are the characteristics of urban agents, systems, and institutions that make them more resilient in the face of climate change? In what ways can local governments influence national legislative and policy frameworks to create an enabling environment for urban adaptation? How can cities engage in a meaningful way in global policy to shape the conditions in which they will need to respond for climate change? With mid-term U.S. elections less than two months away, I have been scanning the news eagerly to locate any references to the significant Risky Business Project report on climate change released in June. I wondered if the report’s critical findings have stoked any passionate fires within any elected officials or their opponents. Alas, political contests this year don’t seem to rest on the future of our country – or any of its political districts – as far as the effects of climate change are concerned. What a shame. Reflecting its remarkable array of leaders on its advisory board, Risky Business has a well-thought-out strategy: Engage influencers from both sides of the political aisle, inform them with potent data that illuminates how climate change is impacting key sectors of the U.S. economy, and then get them to prod their powerful networks to move on mitigating the effects of pollution and other environmental dangers. When lawmakers grasp that message (if they ever do), then climate change will move to the front burners and, hopefully, lead to ways to counter the effects that Risky Business convincingly demonstrates already are impacting crime, food, health, infrastructure and other vital sectors. Recently, the Columbia Journalism Review asked, “Has Climate Change become a business story?” It observed that The Wall Street Journal and the Financial Times published stories ahead of the report’s release. In addition, leading business publications, including Forbes, Fortune and the International Business Times, ran high-profile articles on their websites the day of the press conference. Steven Mufson, an energy and finance reporter, wrote about it for The Washington Post, and the Los Angeles Times’ report ran in its Business section. Long-time National Public Radio economics correspondent John Ydstie covered the news and The New York Times was one of the few that covered the event as a science story. In two weeks during New York City’s Climate Week, ND-GAIN will host an event, What’s New: Corporations Leading Climate Resilience around the World, where corporate officials will relate their story by unveiling the latest innovations in adaptation. Come meet the winners of ND-GAIN’s Corporate Adaptation Prize and join them and the judges for a lively discussion addressing food security, water access, health, and infrastructure solutions in the face of a changing global climate. And, of course, kudos to Risky Business for getting the influencers to shape the biggest change crisis of our time. As the global hurricane and typhoon season begins, a critically important gathering of the World Economic Forum on East Africa has just concluded in Manila, with nearly every session expounding on the tragic consequences and lessons learned from last year's Typhoon Haiyan. Decision makers from the private, financial, and public and development communities committed to instilling more resilient measures in responding to and handling disasters. They expect to shape regional and industry agendas by addressing Association of Southeast Asian Nations, or ASEAN, opportunities for mitigating resource risks and vulnerabilities tied to climate change. Among other issues, participants found common ground on such areas as climate smart growth, decision-making in a disruptive world, green and climate-resilient investments that encompass public-private resiliency funds for disaster-prone areas, solutions for climate and resource risks and enhancements of risk awareness and management. In deliberating, participants considered some of the learnings from Hurricane Katrina, the devastating disaster that struck the Gulf region of the United States nine years ago this August. Its impact on the southeast region persists. For one specific company, New Orleans' electric utility Entergy Corp., the hurricane caused an estimated $750 million and $1.1 billion in damages, according to an Entergy U.S. Senate testimony. It also galvanized the integrated energy company to transform itself into a true climate-resiliency leader. Fortunately, the utility possessed a well-rehearsed emergency-response plan that included safety performance drills, a disaster-recovery plan, communications continuity using satellite phones during repairs, and swift internal infrastructure restoration. A learning organization, Entergy adopted lessons from Katrina and responded proactively to Hurricane Rita the very next month. It shut down various operations and reduced staff to keep more employees out of harm's way. Entergy, of course, serves the Gulf region and can't just get up and move. Since Katrina and Rita, it has invested in wetlands restoration and other community assets to shore up resiliency. As for community resiliency, Entergy ensures a consistent supply of power. Entergy's story offers a great example to companies worldwide at risk from coastal storms. What does that risk look like? In its latest stark report, the Intergovernmental Panel on Climate Change describes significant and worsening environmental risks to the world's poorer countries. And with rising seas, increasing storm intensity and population shifts to cities at the shore, the future promises to be truly tough for millions upon millions of people worldwide. By increasing risks to human health, welfare, and ecosystems, climate impacts can threaten primary development goals -- reducing poverty, increasing access to education, improving child health, combating disease and managing natural resources sustainably. The coastal areas, of course, are on the front lines. As tropical cyclone season arrives (and keeps us riveted to the news, worried about frequent tragedies) and continues through November, one startling fact relays their impact. Since 2005, in Southeast Asia alone, more than 172,500 people have lost their lives to tropical cyclones, and economic losses from them exceed more than $122 billion (in 2014 dollars), according to data from Aon Benfield Impact Forecasting. Of course, the ASEAN region is at particular risk since a disproportionate percentage of the population lives within five meters of sea level, according to the Center for International Earth Science Information Network, or CIESIN. With the exception of Laos, ASEAN countries possess more coastal area -- the percent of land less than 10 meters above sea level -- than 80 percent of the rest of the world's countries. And, again with the exception of Laos, ASEAN countries have more coastal population than 85 percent of the rest of the world. November's deadly typhoon that leveled Tacloban, the Philippines, is likely to be repeated as coastal storms grow in populated areas in these low-lying coastal zones. Some ASEAN countries are less vulnerable and more prepared than others to adapt to these changes. 1. Improving the quality of trade and transport infrastructure. * 2. Establishing good early-warning systems. 3. Adopting building codes that reflect tropical cyclone threats. 4. Implementing insurance mechanism and financing facilities that recognize these threats. 5. Protecting natural capital such as wetlands along the Gulf Coast, sand dunes around New York City and coastal mangrove swamps in Thailand to cushion coasts from storm surges. 6. Increasing the percentage of paved roads. 7. Establishing redundancies in communication infrastructure. 8. Engaging with stakeholders from other sectors and determining who is active in protecting people, natural resources and infrastructure? Being proactive in seeking allies with similar assets at stake who also want to assist, and offering to engage with them. This year, nature will make its increasingly destructive annual pass around the globe with its litany of tragic tropical cyclones, monsoons, forest fires and the like. However, each offers valuable lessons that we must recognize and learn from -- for our sake and that of future generations. A great deal is at stake. Some cities and countries will face economic decline as corporations and others shift their valuable supply chains away from weather-threatened regions. Very simply, climate change rates among the key challenges that developing countries must recognize and respond to in planning for their futures. *Note: According to the Trade and Transport Infrastructure: Logistics professionals' perception of country's quality of trade- and transport-related infrastructure (e.g., ports, railroads, roads, information technology), from the World Bank's World Development Indicators. Editor’s note: This is the third post in a series on the climate adaptation gap. Stay tuned for future installments here on TriplePundit! In case you missed it, you can read the first post here and the second post here. In a previous post, I explained how to determine climate-related risks in your supply chains, capital assets and community engagements. With that knowledge, how do we determine strategies to prepare your most vulnerable assets? It’s likely that a storm will prod corporate risk managers and business-continuity planning managers to take stock and begin instituting telecommuting policies, diversifying their supplier chain to other geographies and advising the small businesses they rely on how to develop a resiliency or adaptation plan. Start with adaptive actions already in place. Shift your thinking to resiliency from greenhouse gas mitigation, and revel in a new set of actions you can feature and enhance as part of a growing global corporate strategy. Review local climate-change impact projections. Prepare an economic risk analysis that adds these risks to your financial modeling for risks avoided. Sets priorities for adaptations with collateral benefits; e.g., mitigating greenhouse gas emissions (onsite stormwater management), improving employee morale (work-from-home options) or buoying your reputation (shoring up public health systems in one of your supplier hubs). Establishes as priorities adaptations with a collateral improvement to your bottom line and your employees’ quality of life. Includes financials for avoided risks to explain and promote any additional costs not covered by collateral benefits. Here is a window into how this sort of evaluation works: Perry Yeatman, Principal of Mission Measurement, the global leader in measuring social outcomes, notes that based on her prior work at Kraft Foods, the key to resiliency in the cocoa supply chain involves examining all the vectors impacting farmers. These include demographic shifts, community engagements, diversity of crops and agrarian livelihoods. She contends that it matters to our ample supply of chocolate bars that cocoa farmers are aging, their children are migrating to cities and farmers need to raise chickens to diversify their nutrition among other personal and community pressures that contribute to crop viability. Businesses new to climate adaptation need only look to peers with their own plans for invaluable resources. They also may find helpful tools from government-backed organizations that understand what climate adaptation looks like and, importantly, how to create an institutional commitment to climate adaptation. Two that I especially like are: Private Sector Engagement in Adaptation to Climate Change, a report from the Organization for Economic Co-operation and Development, and Making Cities Resilient: My City is Getting Ready. 1. Include climate adaptation in a member of the C-suite’s job description. Establish a cross-function climate-adaptation working group as well as connections with local and regional governments in key geographies in your enterprise, especially operations and supply chain. Consider collaborating with key members of your supply chain, industry peers and neighboring businesses on climate-adaptation planning and execution. Ensure that all departments understand their role regarding disaster-risk reduction and preparedness. 2. Include budget lines for both proactive adaptation measures and recouping from extreme events. Include climate adaptation in performance reviews for C-suite members, lieutenants and managers. 3. Incorporate climate adaptation in your initial emergency-preparedness and continuity plans with annual updates. Ensure that this information and the plans for your corporation’s resilience are readily available to your leadership team and fully discussed with them. 4. Invest in and maintain critical infrastructure that reduces risk, such as flood drainage, snow removal, vector-borne disease prevention and heat mitigation for workers and machinery, adjusted where needed to cope with climate change. Consider supply-chain and building decisions with these risks in mind. 5. Assess the safety of all facilities, especially those in locations vulnerable to extreme weather events (coastal, arid) and upgrade or move. 6. Engage with local governments to ensure that climate-adaptation regulations protect residents and economic growth. Identify your most vulnerable employees (age, income, tasks, geography) and plan especially for their safety. 7. Establish education programs and training on disaster-risk reduction throughout your enterprise, not just for disaster preparedness but also for heat exhaustion, vector-borne disease and the like. 8. Protect and enhance ecosystems and natural buffers in and near your holdings to mitigate floods, storm surges, extreme heat and other hazards. 9. Install early-warning systems and emergency-management capacities in your enterprise and hold regular preparedness drills. 10. After any disaster, ensure the needs of survivors are placed at the center of reconstruction. Click here for communications guidelines. Joyce Coffee is managing director of the Notre Dame Global Adaptation Index (ND-GAIN). Coffee, who is based in Chicago, serves as the executive lead for related resiliency research, outreach and execution. Stay tuned for the next post in “The Climate Adaptation Gap” series on Tuesday, June 17. The series is taking a deep-dive into the complicated look at supply chain risk assessment. 1 Put in place organization and coordination to understand and reduce disaster risk, based on participation of citizen groups and civil society. Build local alliances. Ensure that all departments understand their role regarding disaster risk reduction and preparedness. Include climate adaptation in a member of the C-suite’s job description. Establish a cross-function climate adaptation working group and connections with local and regional governments in key geographies in your enterprise – especially operations and supply chain. Consider collaborating with key members of your supply chain, industry peers and neighboring businesses on climate adaptation planning and execution. Ensure that all departments understand their role regarding disaster risk reduction and preparedness. 2 Assign a budget for disaster risk reduction and provide incentives for homeowners, low-income families, communities, businesses and the public sector to invest inreducing the risks they face. Include budget lines for both proactive adaptation measures and recoup from extreme event. Include climate adaptation in performance reviews for the C-suite, lieutenants and managers. 3 Maintain up-to-date data on hazards and vulnerabilities; prepare risk assessments; and use these as the basis for urban development plans and decisions. Ensure that this information and the plans for your city’s resilience are readily available to the public and fully discussed with them. Include climate adaptation in your emergency preparedness and continuity plans initially, with annual updates. Ensure that this information and the plans for your corporation’s resilience are readily available to your leadership team and fully discussed with them. 4 Invest in and maintain critical infrastructure that reduces risk, such as flooddrainage, adjusted where needed to cope with climate change. Invest in and maintain critical infrastructure that reduces risk, such as flood drainage, snow removal, vector-borne disease prevention, and heat mitigation for workers and machinery, adjusted where needed to cope with climate change. Consider supply chain and building decisions with these risks in mind. 5 Assess the safety of all schools and health facilities and upgrade these asnecessary. Assess the safety of all facilities, especially those in locations vulnerable to extreme weather events (coastal, arid) and upgrade or move. 6 Apply and enforce realistic, risk-compliant building regulations and land-use planning principles. Identify safe land for low-income citizens and develop upgrading of informal settlements, wherever feasible. Engage with local governments to ensure that climate adaptation regulations protect residents and economic growth. Identify your most vulnerable employees (age, income, tasks, geography) and plan especially for their safety. 7 Ensure education programs and training on disaster risk reduction are in place in schools and local communities. Ensure education programs and training on disaster risk reduction are in place throughout your enterprise, not just for disaster preparedness, but also for heat exhaustion, vector-borne disease, and the like. 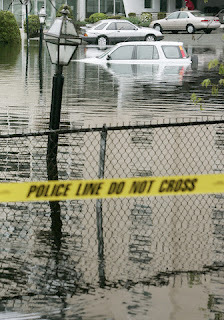 8 Protect ecosystems and natural buffers to mitigate floods, storm surges and other hazards to which your city may be vulnerable. Adapt to climate change by building on effective risk-reduction practices. Protect and enhance ecosystems and natural buffers in and near your holdings to mitigate floods, storm surges, extreme heat and other hazards. 9 Install early warning systems and emergency management capacities in your city and hold regular public preparedness drills. Install early-warning systems and emergency-management capacities in your enterprise and hold regular preparedness drills. 10 After any disaster, ensure that the needs of survivors are placed at the center of reconstruction with support from them and their community organizations to design and help implement responses, including rebuilding homes and livelihoods. After any disaster, ensure the needs of survivors are placed at the center of reconstruction. See http://climateadaptationexchange.com/crisis-communications-are-you-ready-for-a-climate-related-crisis-in-your-business/ for communications guidelines. If any of them inspire you to write a guest blog, let me know! So, let’s save ourselves some time and use not only public resources but the example of a public process to ensure we are climate resilient. 1. Review local climate-change impact projections. 3. Prepare an economic risk analysis. a. Focuses on existing adaptation. b. Considers, especially, adaptations that also mitigate greenhouse gas emissions.